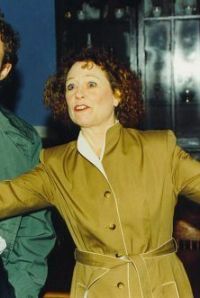 Best Leading Actress, Comedy…Monica Abrahamsen "The Dining Room"
March 1999 - Barry Blake - North Coast Journal - "So it goes. More than 50 characters, played wonderfully by six actors and endless costume changes whirl through the dining room. The actors deftly slip from role to role, child to adult…"
March 1999 - Brenda Bishop - Times Standard - "Monica Abrahamsen is another actor whose quality and range of characterization is like having dessert twice." Beti Traut - Humboldt Beacon - "When you see this show you will understand why it is not as widely produced. Don’t misunderstand. It’s not because of the quality of the script; it is because it’s hellishly difficult to do, and do it right. ……The Dining Room needs six good actors who can play multiple roles and ages….Luckily the NCRT production has all of the above. The strong and versatile cast consists of Monica Abrahamsen……"